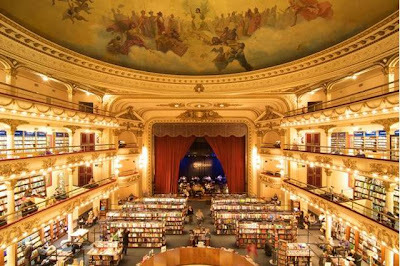 The glorious interior of El Ateneo book store in Buenos Aires. In 1919, Max Glucksman, a recent immigrant to Buenos Aires, Argentina, had a vision to build the grandest, most splendid theater in all of South America. He succeeded. There, Argentinians could enjoy performances across the full spectrum of the arts, and see and hear local favorites. The legendary composer, singer and instrumentalist Carlos Gardel, the King of Tango, was a frequent artist in residence. In 1924, Glucksman began to broadcast Radio Splendid from the building’s fourth floor. In 1929, he converted the venue into a movie palace, and premiered the first movies with sound at the theater. It was a true magic castle of the arts. 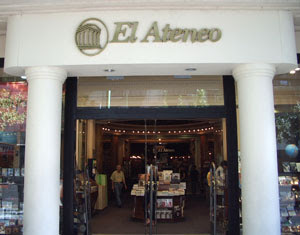 Main entrance to the El Ateneo book store. It is now home to the grandest, most splendid book store on Earth, El Ateneo, (The Atheneum) at 1860 Avenida Santa Fe, in the downtown district. The ground floor houses the main collection, comprised of standard, new bookstore fare. The second floor features all manner of science books, and textbooks. The third floor offers music and a selection of DVDs. The basement has a collection of local and international music, and provides a broad and deep selection of children's literature. The original and opulent high painted ceiling, the balconies, and ornate carvings remain intact, as are the crimson stage curtains that drape the interior. The grand theater boxes provide great spots for reading and relaxing, comfortable chairs are available, and at the rear of the store, where the stage used to be, is an elegant café. It must be difficult to sit and read quietly in El Ateneo. The temptation to rise in ovation and shout "Bravo!" must be overwhelming, and I imagine that at closing each evening visitors stand, applaud and urge "Encore!" An overture heralding the store's daily opening would seem appropriate. It a rare book shop experience. Curtain up, light the lights, and read. It's just your average, neighborhood Indie book store. In a parallel universe.